A $4.5 million federal grant will pay for a new 149-passenger ferry, U.S. Rep. Seth Moulton’s office said Thursday. Meanwhile, state officials are continuing to search for money to operate a ferry beginning this spring through the summer. 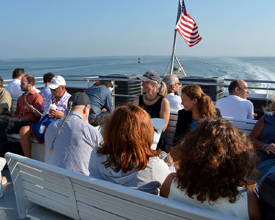 Passengers enjoy the view as they ride the Lynn ferry to Boston. McGee said there is no timeline yet for acquiring the ferry but said the boat probably will not be available this year. He said acquiring a ferry is the key to Lynn running year-round ferry service. “It’s very exciting news. It allows us to run service that works for Lynn,” McGee said. Moulton said a meeting with U.S. Transportation Secretary Anthony Foxx set the stage for the grant award. But he credited state and local officials who have met for the last several months, focusing on ways to fuel Lynn’s economic resurgence. “This is a team effort and an example of how we are progressing for Lynn,” Moulton said. The award cites the city’s success in increasing ferry ridership to 14,557, up from 13,136 passengers over the last two years, but the federal money only slightly overshadows city and state efforts to find cash to operate a commuter ferry from Blossom Street extension for a third year. Operated for the city by Boston Harbor Cruises, the ferry Cetacea made three times daily between May and September from a dock at the end of Blossom Street extension off the Lynnway to Central Wharf bordering downtown Boston. Each trip took about 30 minutes and cost $7. State Rep. Brendan Crighton has filed an amendment to the Massachusetts House budget to provide $650,000 in state money to run the ferry for another season. McGee said legislators continue working with state officials to find money to operate a ferry this summer. “We have some ideas – I’m optimistic,” he said. McGee, Crighton and other legislators and city officials, including Economic Development and Industrial Corp. director James Cowdell, successfully sought out $1.5 million to operate the ferry from May to September in 2014 and 2015. “This grant will allow us to purchase our own ferry and help us move toward our goal of providing year-round ferry service,” said Cowdell.